There are many activities to try in the wine region of Napa Valley, California. It is about a 90-minute drive away from the city of San Francisco. Napa Valley is a wealth of many things — breathtaking landscape, food, activities and festivals, and wine grapes and wines, of course. When we say “hidden gems,” we mean wineries that are usually off-the-radar to most visitors. You could be at an advantage there if you’re set to discover a lot more wineries, as not too many tourists know the immediate whereabouts of these little-known wineries, or what they have to offer. These wineries can be a lot of things: they may be relatively unknown, their location is obscure, or they are really small wineries (most wineries in Napa are family-owned, by the way). These “hidden gems” will provide you less stuffy and more intimate wine tours that you may not have experienced with the more established ones. Many of these small-time wineries provide stunning and unique architecture. Their buildings and decorative pieces can be called a work of art themselves, such as in the case of Artesa Vineyards, The Hess Collection, and Winery and Cliff Lede Vineyards. While other wineries offer breathtaking views of the vineyards. But the main draws to these wineries are, of course, the wines themselves and the enthusiastic, warm staff. Needless to say, those are the reasons why well-informed tourists keep coming back to these smaller wineries. It’s true that being surrounded by Napa’s mile-long vineyards and discovering varietals provide a great experience. But sometimes, you wonder if Napa Valley is just all about grapevines. And the answer is definitely no! Napa is a rural and natural wonder — its Mediterranean-type climate and fertile soils provide lots of other plants and crops to grow, not just wine grapes. Want to be awakened by the fragrance of lavender, and also to be surrounded by fields of lovely lavender blooms? You don’t need to go too far because it’s right here at the heart of the Napa! Harms Vineyards and Lavender Fields has a beautiful farm where they grow only organic lavenders, from where they make essential oils, bath salts, mists, potpourris, and a lot more. It also sells lavender bouquets. You may visit Harms Vineyards, maybe have a picnic there, and feel relaxed by just breathing in the aroma of the lavender blooms wafting through the air. And oh, you may pick some grapes too! Bringing the kids along? Napa Valley is for the little ones too, although it doesn’t seem like it! Sure, children can’t drink wine or visit most wineries, but you can take them to the farm! If you’re planning a summer visit with the kids, bring them to Connelly Farms in downtown Napa. There, kids will have opportunities to unplug and get in touch with nature. They will learn farming and gardening (kids love to get their hands dirty) hanging out with farm animals and rearing them, and more! The ranch allows the kids to learn about nature at their own pace, and also to make new friends along the way! You may also try visiting Napa Valley in the winter, which is the off-season in the region. Be amazed by the vast brilliant yellow fields of wild mustard blooms that overwhelm the dormant vineyards. You may have biked around the fields, hired a chauffeured limo bus to take you to the wineries, or hiked all the way to the summit of Mount St. Helena and enjoyed the panoramic views of the vineyards. But if you’ve never heard of hovering above the Napa fields, you dismiss it as too far-off. But it is real — you can explore this beautiful region from up in the sky! One of the ways to do it is by hiring a chopper, but it could be noisy and besides you will not be able to enjoy 360-degree views of the fields and valleys. 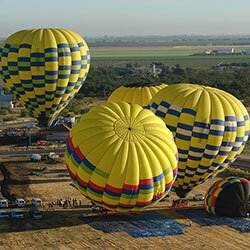 The better way to get the bird’s eye view is by experiencing the pleasure of a hot air balloon ride. There isn’t a better way than by choosing to fly with Balloons Above the Valley (BATV)! Hot air balloon rides give tourists a peerless experience. They may have seen the expanse and beauty of Napa, but a hot air balloon ride allows them to see the whole landscape as a work of art — like a huge landscape painting! BATV makes it happen so you and the other guests can enjoy the full expansive views of Napa and its lush vineyards, famous valleys, majestic mountains, and rolling hills. If you fear about safety, you might as well forget it as soon as you are inside the basket! That fear will turn into thrill and awe as you get to enjoy the stunning views of the Napa landscape. Our experienced and licensed pilots are also one of BATV’s draws — they are not only professional but are also personable, friendly, full of info and stories to tell, and have a passion for both flying and meeting people. You will be in safe hands as our pilots expertly maneuver the floating balloon. After the flight, you will be greeted with a champagne brunch where you will celebrate the successful flight with your new friends! How cool is that? These are only a few of the different activities to try Napa Valley, California. And if you’re planning a Napa holiday right now, don’t forget to include a BATV hot air balloon ride to make it even more unique and unforgettable.